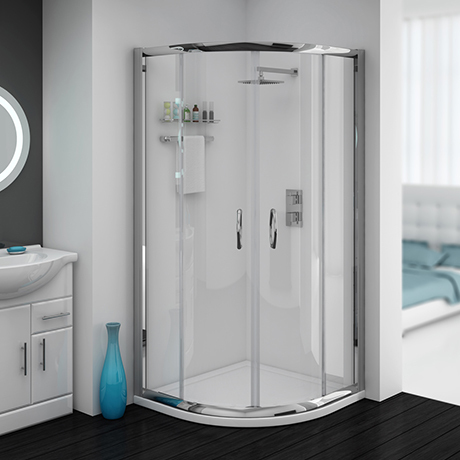 The Cove shower enclosure with pearl stone shower tray and chrome finish waste, a stylishly modern quadrant shower enclosure combining both style and practicality that offers a generous showering space with twin sliding doors for easy access. This elegantly simple Quadrant Shower Enclosure features modern bow handles and toughened clear safety glass. Supplied with a strong white finish quadrant shower tray and 90mm fast flow chrome shower waste. Waste maintenance and cleaning is achieved through the quick release inner unit. Designed to fit directly to the shower tray waste and the standard 40mm (1 1/2") waste pipe. Hi Emma, This tray 30mm thick. Thanks! Q. Hi, can you tell me wether the shower tray is made of stone resin, please? Hi Tracy, this shower tray is made from a unique pearlstone matrix - acrylic capped and constructed from a polyurethane resin mixed with filler including volcanic ash. I hope this helps, please let me know i you have any further questions. Well made. Cheap. Gonna love it. "Although not yet installed, this shower enclosure was great value for money. The tray seems very sturdy & solid with the extras ""excellent value for the money paid""." "Easy to install, and come with all parts." THIS IS A TOP QUALITY SHOWER ENCLOSURE AND TRAY. Absolute pleasure to deal with from ordering delivery and contact with queries nothing is too much trouble staff are efficient and friendly. Was exactly as shown all parts there and looks great. Haven't had installed yet but all seems good with order. Quick delivery. Would use company again. "See previous. The CHEAPEST, BEST QUALITY AND SPEEDY GONZALES delivery." Great product easy to install and great service from delivery driver.